Last week Andrea DiMaio wrote an interesting post on how Government 2.0 may be approaching the peak of the hype cycle. I’d never seen the hype cycle before and it looked fun, so I thought it might be interesting to try to map where I believe some current Canadian government 2.0 projects, a few older technologies, and a few web 2.0 technologies in general, are against this chart from a government perspective. My suspicion is that we haven’t even begun to dip into the Trough of Disillusionment with most true Web 2.0 government projects (GCPEDIA & GCConnex). However, I think governments have overcome their paranoia about facebook, but are still very wary… that said I’ve noticed some government ministries have started to use facebook as a communication tool with the public. Blogs however (which are perfectly okay for public servants to create internally) are still viewed with suspicion – internally they are almost never used. But then, heck, given the cluttered nature of most government website (and the fact that finding info is hard), I think it is clear that we are still working our way up the “Slope of Enlightenment” on this web 1.0 technology. So I’ve also included how I think the three stages map against this chart too. This entry was posted in public service sector renewal, technology and tagged canada, government, government 2.0, public service sector renewal, social media, technology, web 2.0 on September 28, 2009 by David Eaves. Nice – I agree that it is very early days here in Canada for “Government 2.0” – we're no where near as far along the adoption curve as in the US or the UK. I agree with you David. As Peter points out that Canada is behind the adoption curve in the US, I would say Germany is probably even further behind. Although there is a FixMyStreet clone now in one of the Bundesländer. And how far to the left is cloud computing ?GoC using Amazon ? Public data encrypted but stored outside of the GoC's bricks and mortar in a public cloud (vs an outsourcer private environment).Good chart. I like the duality of the hype cycle and stages of truth. May I borrow the concept ? This is a common cycle for all technologies. I thought Ms. DiMaio's comment on making Goverment 2.0 more employee-centric. Taking this approach certainly has the promise of driving more value from open data initiatives in particular. I don't have much exposure to government 2.0 initiatives other than the one BarCamp I attended here in Vancouver, but it seemed to me that, at least in the case of Vancouver, not enough analysis was done to really identify the data that would drive real value. In other words not enough analysis and requirements gathering, but rather a more reactive stance to the “hype”. This in turn would help to move through the “trough of disillusionment” more quickly. One final thought, email may be going through a renaissance as software vendors inject social capabilities into email. A couple right here in BC are Thoughtfarmer with their “discussion capture” feature and Groove Systems that's developing a SAAS that aggregates email conversations and has some other great features. On the enterprise front IBM is doing some interesting things with Notes mail. Interesting that the person-centric social network; facebook, in your graph, has ecliped the information-centric social network tools, namely blogs and wikis.Where did you gather that conclusion from? I would suggest the title should be Government technical adoption curve of Social Media. Gov 2.0 is built on Web 2.0, where data is the core commodity…not social media. For a set of definitions, from Gov 2.0 to what Gov 5.o may look like go to http://bit.ly/1wa3SeThat being said I like the idea of visualizing technological adoption in this manner. The flaw might be this is larger than technology..it is a more of an institutional change. Good work! Bx Mx – thank you for commenting. I'll confess that the points were not placed using any scientific process – just my own assessment. The main reason I have facebook outpacing blogs is because there are virtually no official federal government blogs (the information commissioner has one, but I can't think of anyone else, internally or externally facing). However, a few departments have become wise to using facebook as a way to share information – look, for example at the official Public Health Agency Canada Facebook page. 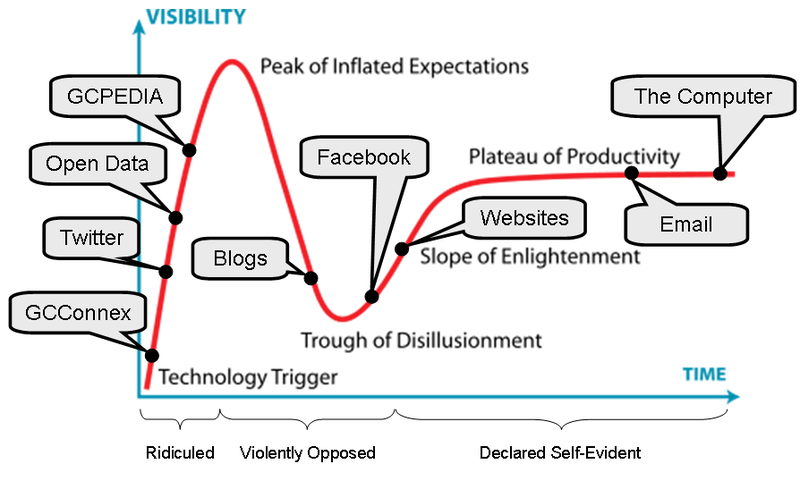 I was at the GTEC conference this week and heard a lot from TBS about GCpedia and how it's moving to production, etc, and I have to say I had an ominous feeling about the trough of disillusionment that you have illustrated so well. Undoubtedly when it is moved to production there will be a lot of fanfare (i.e. : The height of visibility), a bunch of people will check it out, and be disappointed.I'm here because Tim O'Reilly plugged your blog at the conference … I like what I see!